Discussion in 'Australia & New Zealand' started by Chuq, Oct 3, 2018. 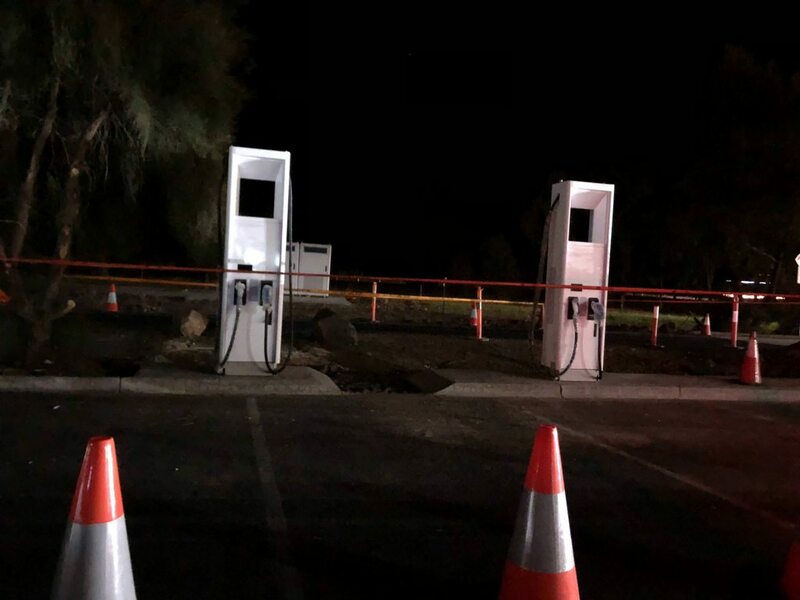 Australia is going to get its first two 350kW charging stations in Victoria, thanks to the Vic Government and JetCharge! At the moment it sounds like 2x ABB 350kW chargers, and 2x Tritium 50kW chargers, at each site. All to be Chademo and CCS2. They are under construction now and proposed to be done by the end of the month. I know this duplicates the supercharger network in the area, but I thought some people here might be interested... and perhaps willing to scout out construction photos? Very interesting, but Tesla only support up to 120kW so it's hard to even see who they have in mind for these 350kW stations? Porsche allegedly are pushing for 800V 350kW charging but they're not Chademo and CCS2 and haven't even released a BEV yet... I don't understand what's going on, but I'm all for anticipating future developments... High voltage/power charging sounds nice but realistically with safe battery management you won't be able to use the maximum power charging except for a very narrow window, probably 40% of the total charge. it's future proofing. Upcoming vehicles like the Kona, i-Pace, etc. can charge at 70-100 kW. The 2019 Nissan Leaf can reportedly charge at 100kW. Future Mercedes and VW vehicles are saying 150kW. There will be very few that use the full 350kW except for the Porsche Taycan (formerly) Mission-E - if it ever makes it here. * Will the EU spec (which we get in Australia) have a CCS2 socket? * 120kW is a limit of the supercharger - is the car the same or can it go higher? * The existing Chademo adaptor currently doesn't work on the Model 3 - and is 50kW limited - will they release a new adaptor that supports over 50kW? With the IONITY network being built in Europe, Tesla are going to want to make sure the Model 3 can use it, so it is good for us to deploy the same spec chargers. Big mistake with the locations chosen. Both near existing superchargers. Given that 90% of the long range EV's at the moment would be Tesla's - who is going to use them? You're right. There's no reason for the car itself to be limited to that; that was a practical choice Tesla chose, and there was a comment from Elon that perhaps 200kW would be considered in the future. They certainly have the battery management system smarts to make it adapt to whatever the maximum feasible power would be, but I expect the taper to be intense. As it stands, I don't see mine getting 120kW past about the 63% charge mark. Congrats and kudos to JetCharge for securing the contract and completing the work so efficiently, but the A$1 Million spent got only 2 sites. If the Victorian Government specified lower capacity sites, I.E. around 100Kw perhaps they could have made the network a bit larger. I'm guessing that the infrastructure for 800V 350Kw would be substantially more expensive not to mention the chargers themselves. These locations seem to be a smart move by Chargefox/Jetcharge as non Tesla EV drivers will be forced to use them when traveling long distance on the Hume. Jetcharge are obviously preparing for Ipace and the Korean long range EVs (if they ever arrive here). As Tesla drivers we have the luxury of pulling into the superchargers at Euroa (for free in most cases) and enjoy the river or a short stroll into the old town. I'd much prefer this than fighting the Icers and Jaguar owners over two chargers at a dirty Maccas petrol station. being electrified. Melbourne has just launched its first BEV garbage truck. I fully expect that when the Supercharger V3 (200-250 kW) is announced, part of the launch will be "Oh, by the way... those 100,000 Model 3's that are already out there can take this speed." I can dream.... even though the spec for CCS2 does not allow adaptors.. I think there is a C rate limit on the cells in the cars. That's why the 75 cars charge slower than the 100 cars. Each cell is charging as fast as it can, but the 100 packs have more cells. I think the superchargers can do 150kW, but the cars can't. Which again makes me wonder what they anticipate will take the 350kW in this article. I guess they chose that based on the Taycan allegedly being able to charge at that as some kind of upper limit for (short term) future-proofing. It seems bizarre to me to install a 350kW charger. It just highlights how random and disorganised the move to the EV future is (Tesla excepted). Most chargers of this type have 2 cables, one a J1772 and the other a CHAdeMO. If the J1772 is the Combo Coupler variant of the J1772-2009 connector allowing charging up to 90 kW, there is at least the plus that potentially 2 cars could charge up at full rate. If both are CHAdeMO or there are multiple plugs that would be even better. Haven’t seen them yet but as the MTAA have come down on the side of the European Type 2 system the ChargeFox chargers will almost certainly by CHAdeMO and CCS2. It looks like going forward Nissan / Mitsubishi will be J1772 for AC Charging and CHAdeMO for DC quick charging and Type 2 CCS2 for everyone else. In fact I saw a new i3 Charging at Bondi Junction Westfield that had a Type 2 port whilst the early i3s in Australia came with J1772 ports. There is a good chance the new Leaf will be Type 2 for AC, the current gen Leaf is Type 2 in Europe with CHAdeMO for DC. Yep - spoke to someone at AEVA who has confirmed this from Nissan. Type 2 + Chademo. Hi Chuq, image doesn't appear to be working. Sorry - have re-hosted it below!